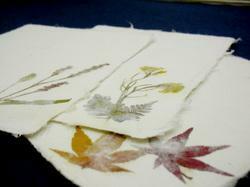 Japanese Paper Making Using this Distinct Deep-Snow Country Process. ‘Washi’ (Japanese traditional paper) is made from wood fiber, making it stronger than today’s more common paper made of wood pulp. 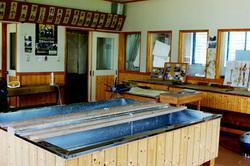 And the Uchiyama style of ‘washi’ made in northern Nagano’s Iiyama City is especially durable. See for your self, and experience making some yourself, at the Iiyama Tesuki Washi (Handmade Paper) Taiken Kobo (Activities Workshop), conveniently located steps away from Iiyama Station. 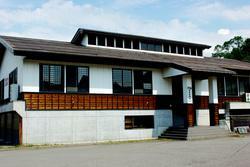 Iiyama's 'washi' tradition called "Uchiyama" is renowned for the strength of the paper. Due to its strength it is commonly used as the paper in shoji screen room dividers. For over three and a half centuries, craftsmen have been taking advantage of Iiyama’s cold winters, heavy snow fall, and clear running water to make Uchiyama-style ‘washi’. You, too, can try your hand at making ‘washi’ and create a postcard, colored paper, bookmark or haiku paper. Postcard 210, colored paper 520, bookmark 620 for 12, haiku paper 620 for 3.